Last time I blogged about a fairly simple but powerful “Big J” journalism project we did years ago in my hometown, shaking up the judicial system in a very positive way. Here’s another “Big J” project we did back then. It can be done in any community, and it will reveal very interesting things about who has and wields power in the community. Read further to learn how, and to see clippings of the stories we produced. 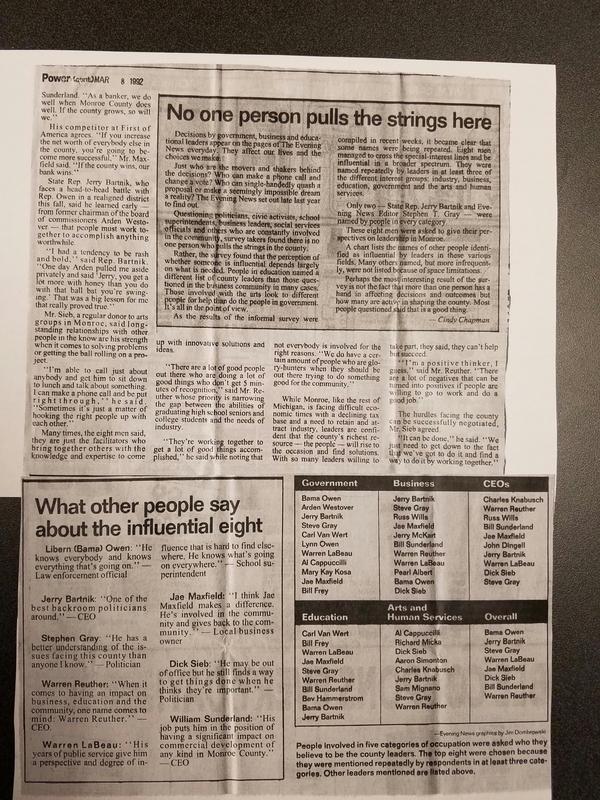 It started in 1992, when I was editor of my family’s newspaper in Monroe, Mich. At the time, I was doing some serious thinking about the local power structure. The trigger was some disturbingly dysfunctional behavior I was seeing among the various political units at the time. See links farther down the page to access clippings. Cities and neighboring townships were feuding on various topics. The elected officials were deploying zoning and development policies designed to maximize growth at the expense of neighboring governmental units. Annexation battles were ugly and divisive. I started to think about who really pulled the strings in our community. Who operated behind the scenes? Who could apply pressure or persuasion and get things done — or stop them? I didn’t really know, although I had some ideas. I’d heard that this or that individual was quietly powerful or influential, but the only people who were routinely visible as decision-makers were the elected officials. So, in the newsroom, we started trying to figure out a way to reveal who actually had political, economic or social clout in our community. We came up with the idea of doing it with a survey. We decided that the best way to conduct it was to send it to a list of people we were certain had power or influence, asking them to name others who did. We would ask each one of them to name people in his or her own sector, and we would ask them to name those with wider spheres of power or influence. We hoped this would produce some visibility into the unknown networks of individuals who actually had and used some amount of power, authority or influence to make things happen. I wish I could provide a copy of the survey here, but that’s long gone. I’m not even sure that I recall quite how we did it. 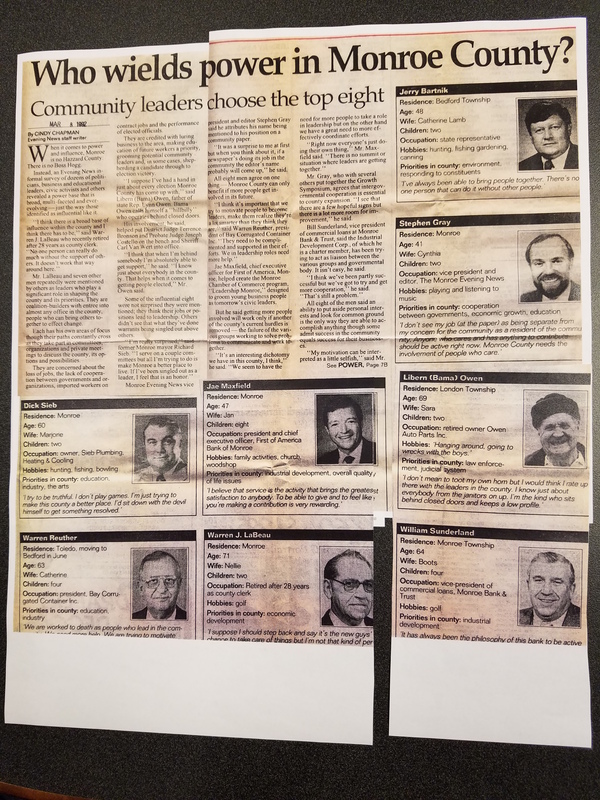 I think I wrote a cover letter that told the survey recipient that he or she had been identified as one of the powerful or influential leaders in Monroe County. I think the letter explained that we were attempting to identify who else in Monroe County wielded power or influence, so we wanted them to fill out and return the enclosed survey. The survey asked each recipient to name other individuals they believed had the most power or influence, and it gave them space to explain the reason for each name they listed. We asked them to complete the survey and mail it back to us. A few days later, the response was looking very good. “What’s the good news?” I said. “The good news is, there’s a lot of consensus on who is most powerful or influential. And there are two people who were named by every sector,” she said. I was flabbergasted. It hadn’t occurred to me for a second that I would show up in the survey. And now I was going to have to be quoted in the story, trying to explain away my presence on the list. As I saw it, I kept a low profile. I didn’t belong to civic organizations other than my church, didn’t call leaders and try to influence them, didn’t eat lunch or play golf with power brokers. I just directed the newsroom as we covered our community. And I just wrote local editorials. And I had recently led some behind-the-scenes planning that produced a major civic retreat and discussion about how best to manage growth and progress in our community. Well, as I saw it, all of this was just doing my job. I was just trying to keep the community well informed, keep people focused on the important local issues, and encourage other people to move those issues ahead. I wasn’t wielding power, although maybe I was exerting influence, in a broad way. The survey gave Cindy a great opportunity to talk to those who were named, getting their comments about how they saw the community’s needs and how they worked to get things done. We produced a sidebar on each of the eight most-named individuals, with photos, factoids and quotes. It was a fascinating read, and it generated immense amounts of buzz in the community. And it did succeed in teasing out identities of some folks who had operated entirely behind the scenes. Check out the sidebar on Bama Owen, a local Democratic Party kingmaker who had operated for years with total invisibility to the public. Best of all, the project placed a bright spotlight on the civic power structure. It revealed that power was spread across a wide base, and it put faces and identities to names both known and unknown. And it didn’t take weeks or months of hard-pounding investigation. Just a survey and some phone calls. It’s a project that would work very well in thousands of communities, and it would drive strong readership and community discussion. Why not give it a try? Posted on February 21, 2017, in Audience, Content, Disruption, innovation, Investigative reporting, Journalism, News, Newsrooms. Bookmark the permalink. 1 Comment.